As you know, we've been out of town for a few months, but our friends A and G have kept up with the dining scene in Seattle and tonight we went to a new restaurant they discovered called Tilikum Place Cafe on Cedar and 4th. 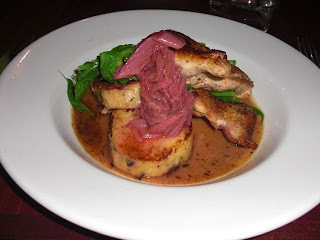 Wow - it's good to have friends who know the food scene because this place is really tasty! 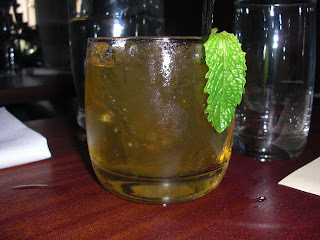 JC started with the mint julep, a southern staple that is rarely found on the menu in the Pacific NW. It was well done and delicious! 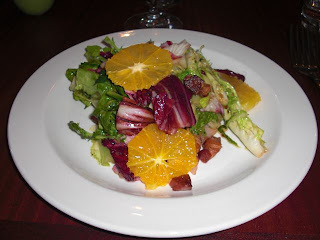 I started with bitter greens with warm bacon vinaigrette, dates, and orange. 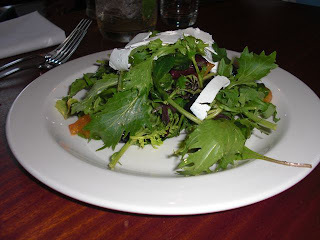 The greens were beautifully wilted with a smokey bacon vinaigrette - delightful!! A's romaine with shaved parmesan (let's just call it a Caesar, shall we?) was a work of art. JC's salad was light and had a lot of lovely blueberries. 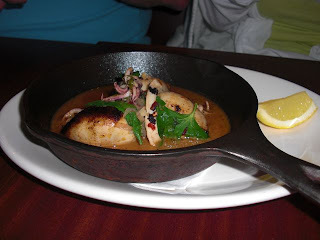 G had the stuffed calamari - delicious! 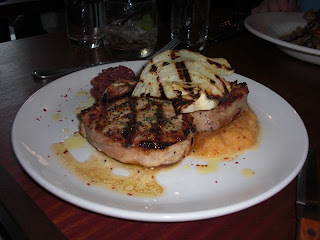 JC ordered the pork chop with pureed sweet potatoes and grilled cabbage - tender and delicious. 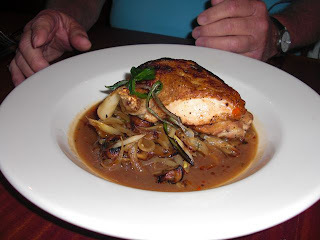 The rest of us had the seared chicken with various accompaniments - really good!! 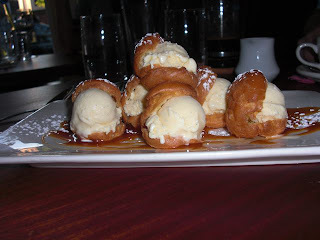 JC did the tasting menu which allowed him dessert - cream puffs, stuffed with ice cream and glazed with a caramel sauce - wow!! We will definitely go back - can't wait to see what A and G have discovered since we've been gone that will top this or Gambas!! Wow...the food looks good. Were all those cream puffs for one person? Something you could also talk about is the atmosphere of the restaurant, service, etc. I also like pictures of the bathrooms! Ha! The service was great. Didn't go to the bathroom, but I will start checking them out. I remember the bathroom at marjorie always had a turntable playing old music! 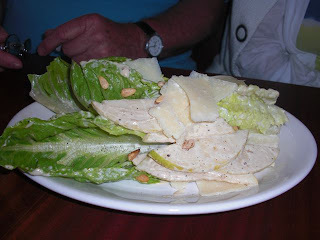 G said A's salad had sliced pears in it - looks like pine nuts, too.